SodaStream Crystal has an average rating of 4.38 out of 5 based on 8 user reviews. The SodaStream Crystal is similar to the original device that allows you to make soda right at home instead of buying bottles of soda that sometimes go to waste. The Crystal version is a bit smaller than the original, which makes it easier to keep on a counter because it doesn’t take up as much space. The angle of the bottle underneath the machine can sometimes make it difficult to get the bottle out so that you can pour soda into a glass. Size: 6.25″W x 17.2″H x 10.5″D. Comes with the soda maker, a 60L carbonator and a one liter glass carafe. The SodaStream Crystal is simple to use but isn’t the most efficient soda maker out there since you need to raise and lower its head each time. Fill the glass carafe with water. Unlock the soda maker, raise the head and insert the glass carafe into the bottom part. Lower the head onto the glass carafe and lock it again. Press on the button on top for 3 loud buzzes or until the desired level of carbonation is attained. Unlock the soda maker, raise the head and take out the glass carafe. 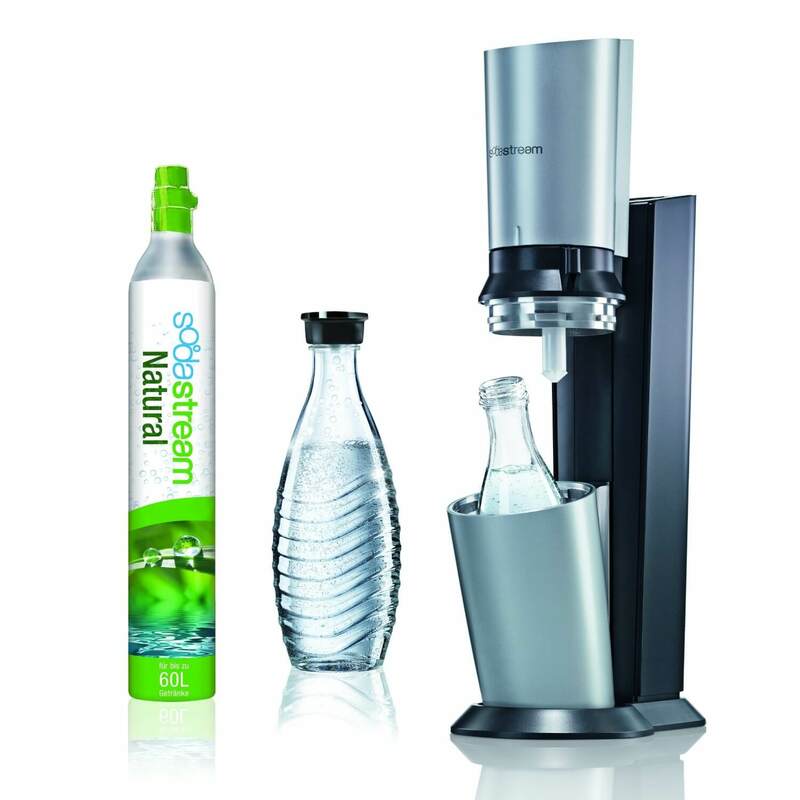 The SodaStream Crystal uses 60L SodaStream carbonators that, as their name implies, allow for carbonation of roughly 60L of water (most users do however report around the 50L range). Empty carbonators can be exchanged for full ones at various retailers such as select Bed Bath & Beyond, Costco, Target, etc. To find a retailer close to you.. Every exchange costs $14.99 but there are cheaper, DIY options. The SodaStream Crystal mainly differentiates itself through its use of glass carafes instead of plastic carbonating bottles. Also, it has very good build quality, even for its price. On top of that, it benefits from a uniquely modern design that will look good in most kitchens. While the bottle is in place, the SodaStream automatically locks so that it doesn’t move around while the soda is filling the bottle. There is also a cup that the bottle sits in that keeps it from moving around while the soda is dispensing. This is a benefit even though it’s hard to remove the bottle after it’s full. A trendy option is that the machine uses glass bottles. This gives the machine a bit of a classic feel to it when making soda instead of using a lot of plastic bottles that are just thrown away. The glass bottles can easily be washed and reused again, which is something that’s enjoyable for a larger family. A downside of the SodaStream Crystal is that it is a little more expensive. Part of this is because it does use glass bottles. There are also smaller CO2 canisters used with this machine. You have to change the soda more often compared to the larger machines, which can be an issue if you drink a lot of soda or other beverages that you can make with the machine. There are no batteries or electrical cords with the machine. All you have to do is install the CO2 canister and the bottle of soda that you want to make before pushing a button to make your beverage. This is a new version of the original SodaStream, so there are a few things that could be changed. Overall, it’s a good machine to have on a countertop. With all of the metal that the machine is made of as well as the glass, it offers an elegant and sophisticated look for the kitchen, something that the original device didn’t deliver. You can use as much or as little of the soda when you’re using the machine depending on whether you’re making a bottle for multiple people or just for yourself. You can also make sparkling water with the SodaStream Crystal. Users enjoyed the high build quality of the SodaStream Crystal and found it easier to use than the SodaStream Penguin. A few people had issues with certain components not working but found the customer service to be helpful. They also enjoyed the fact that it uses a glass carafe instead of a plastic bottle and like the design and look of the SodaStream Crystal. Our whole family has been drinking sparkling water for years. We typically bought the sparkling water in cans. But, I was concerned about how much trash we were creating. I was also aware of the possible health risks involved with canned beverages. With that said, I am glad we invested in the SodaStream. I love the attractive glass bottles that seem pretty durable. We are now doing our part to save the planet. I also commend the company on their prompt customer service. I originally could not get the CO2 canister to function properly. The customer support representative helped me solve the problem quickly. After buying my machine I began having problems. The jet hose that inserts in the bottle sometimes bent to one side. Once it even got lodged and broke when I tried to fix the jam. I also felt that the carbonation bubbles were too large for my taste. I was used to the finer carbonation that comes in store-bought varieties. I notified customer service of the problems I was having, and they sent me a new machine. I bought the SodaStream for one of my children. Since they were living with me at the time, I was able to use it daily. I also bought a couple of extra glass bottles. We’ve been using the machine for a month and still have not run out of CO2. We carbonate the bottles and store them in the refrigerator. We enjoy camping in our RV, and the soda maker is just the right size to pack along. I am determined to buy the SodaStream when I am once again living on my own. We bought the Crystal to replace a previous Penguin model. The overall design is a vast improvement. I like the fact that all I have to do is push a button instead of pulling a lever. The new machine also fits better on our countertop. Loading and unloading the bottles is much more refined. The Crystal is also less noisy. We love our sparkling water and typically keep a number of pre-made bottles on hand in the fridge. We also have plenty of backup CO2 canisters. We indulge in sparkling water on a daily basis. While it is a bit of a hassle to have the canisters replaced, it beats spending the money on buying bottled water. My first SodaStream Crystal lasted for five years without a problem. It is well made. The Crystal is one of the best investments I have made to date. I filter the water using a Brita pitcher and pour it into a glass carafe. After carbonating the water, I mix it with fresh fruit juice. I love the fact that I am saving money. I am also pleased that I am doing my part to improve the environment. I additionally no longer have to worry about getting toxic chemicals from drinking out of plastic bottles. The SodaStream worked great for six months, and then it quit. No carbonation or lights. For the price, it should be made better. I am so disappointed since I loved having my fizzy water whenever I wanted it, now I don’t know what to do. I wanted a SodaStream soda maker for a long time. But, I could not decide which model to buy. The first machine I bought came with BPA-free plastic bottles. They may be free of BPA, but I was still leary of the other possibly toxic chemicals the plastic might harbor. I am not a fan of plastic beverage or food containers. I later bought the Crystal and am happier with the glass carafes. The machine is very well constructed. I used it every night for three months and still have not emptied the first CO2 canister. I also like the fact that I do not have to buy and carry a bunch of sparkling water bottles from the store that eventually end up in a landfill. Months later, I am still enjoying my homemade sparkling water and the money I’m saving. After first buying my SodaStream, I had a nice cold, carbonated drink within minutes. I ordered four extra glass carafes to have on hand. In about the first two weeks, we enjoyed approximately 50 liters of sparkling water. For the sake of convenience, I keep a gallon jug of water in the fridge that I use to fill my bottles. Using the machine is quite simple. I put a bottle into the tilt-forward flask container, slide the bottle back and the top down. I twist the latch and fill the bottle with CO2. I move the twist and push locking lever back and the top automatically goes upward. The flask tilts forward and you easily remove the bottle. To punch of the taste, I add a squirt of flavoring syrup. I cap the bottles and store them in the fridge. I am amazed that on the next day, they are still sufficiently carbonated.